New Jersey July 1st, 2015 – After almost a century of injustice, innocent car parkers of the United States have finally been given a voice. Jackass Parking Chalk, what the founders call “emotional expression utensils,” now provide frustrated citizens a product and platform to take on this all-too-common social crime. Two residents of New Jersey, the state with one of the highest percentages of parking assholery, decided to take matters into their own hands. To solve this seemingly unfixable situation, the husband and wife duo developed Jackass Parking Chalk and an associated social platform. “We came up with it together after discussing our frustrations for people on the planet who don’t have the consideration to do something as easy as parking their vehicle correctly,” said the New Jersey husband and co-founder of Jackass Parking Chalk. Jackass Parking is an epidemic and Jackass Parking Chalk is the cure. Across the country, good citizens are robbed of potentials spots by Jackass parkers — but the story no longer stops there. Chalkyou.com, a social/community platform, allows Jackass-parking victims to share their emotions and a photo of the misdeed. Jackass Parkers are not only made aware of their action on the spot but also publicly declared as such. In order to maximize awareness, each photo submitted via the website is automatically hash tagged with #ChalkYou and is then shared across the Jackass Parking Chalk Social Media channels, including; Facebook, Twitter and Tumblr. 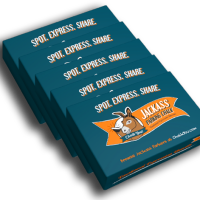 The product is easily purchased on the website and instructions on how to use Jackass Parking Chalk are laid out simply as: SPOT, EXPRESS, SHARE. “Keep your chalk on your persons or in your car’s glove compartment. During your travels, keep a watchful eye for Jackasses. You’ll be surprised how many are out there!” With Jackass Parkers spotted from New Jersey to California, the map begins to bring justice to sacrificed parking spots, the people who wanted them and the Jackasses who took over them. The founders believe that each act of expression and sharing is an act of awareness. We can help each other help ourselves by buying Jackass Parking Chalk and ridding the country of this social crime — one spot at a time. Note: Jackass Parking Chalk is a gift to society, so let’s not ruin sidewalk chalk for the kids. Please do not be extremely offensive or use Jackass Parking Chalk in any unlawful way while expressing your emotions. Jackass Parking Chalk’s aim is to bring more order and awareness to communities, not chaos. Jackass Parking Chalk was developed by two New Jersey residents to combat jackass-parking across the country. 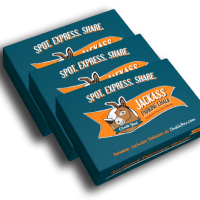 The chalk is packaged with a social platform that allows those affected by jackass parking to express their emotions and share the deed on chalkyou.com. The product is thick, durable non-toxic chalk that washes from hands, clothes and surfaces very easily. Jackass Parking Chalk aims to provide non-confrontational justice to jackass parking and does not encourage unlawful or offensive behavior.